A hospital in Potiskum said it had received the bodies. 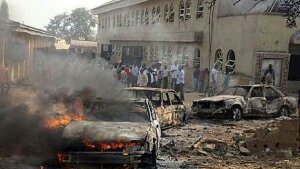 A suicide bomber has killed six people at a church in Potiskum,Yobe State this morning, Sunday, July 5. The attack on the church is believed to have been carried out by Boko Haram terrorists. IA Red Cross official, Hassan Muhammad said, “people were just going to the church when the bomber entered, otherwise the casualty figure would have been higher.” A hospital in Potiskum said it had received the bodies. The sect had killed more than 200 people last week, which prompted renewed outrage and calls for an international meeting to coordinate the offensive against Boko Haram. President Muhammadu Buhari is due to visit his counterpart in Cameroon after the Muslim holy month of Ramadan and also due to meet U.S. President Barack Obama on July 20, when the fight against Boko Haram is likely to be high on the agenda. French President Francois Hollande had also said the Boko Haram threat is getting stronger and that he is ready to hold a summit, following one in Paris in May 2014, to gather the leaders of countries fighting the insurgents.